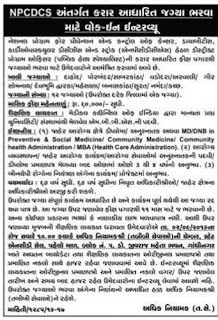 National Programme For Prevention and Control of Cancer, Diabetes, Cardiovascular Disease and Stroke (NPCDCS) Gandhinagar Published Recruitment Advertisement for District Programme Officer (Public Health Specialist) Posts. District Name : Dahod / Porbandar / Sabarkantha / Vadodara / Aravalli / Gir Somnath / Dev Bhumi Dwarka / Mehsana / Banaskantha / Surat / Narmada / Kutch. 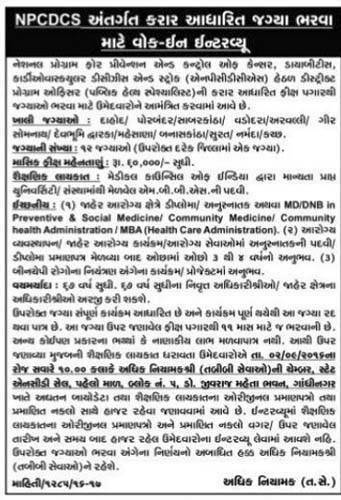 Walk in Interview Place : Additional Director (Medical Services) Office, State NCD Cell, First Floor, Block No. 5, Dr. Jivraj Mehta Bhavan, Gandhinagar.